Join me, Sheila Jones in my studio, The Mulberry Shed, on the beautiful Polden Hills in Somerset (10 minutes off J23 of the M5) for a Silk Painting Workshop. 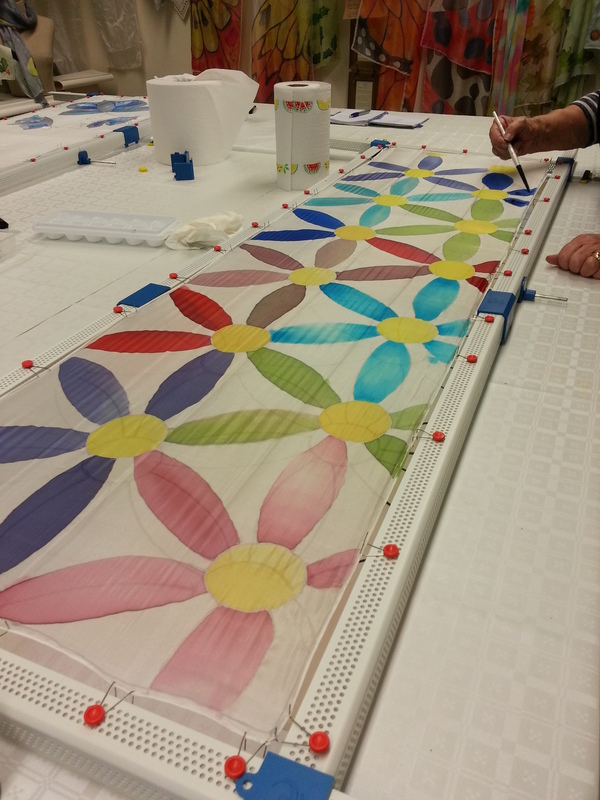 Enjoy a fun, creative day learning about the art of silk-painting using outliner and other techniques with steam-set silk dyes. 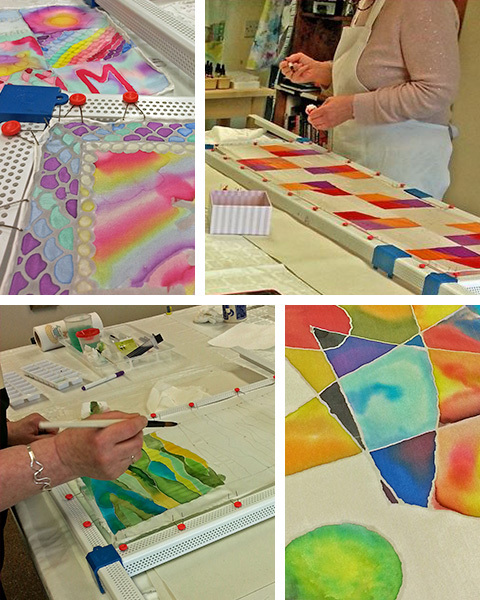 Experiment with creating your own designs, painting on silk and producing vibrant art to wear or hang on the wall. The days run from 10.30am to 4.30pm, with a maximum of 4 students to ensure everyone has space to work and time with me. Unlimited tea/coffee and biscuits provided – just bring a packed lunch and your creativity! The cost is £60 per student and includes the use of equipment, your silk handkerchief, scarf or fabric and the steaming process needed to set the silk dyes. Following the Workshop your pieces will be steamed in my professional silk-steamer, washed, pressed and sent to you. 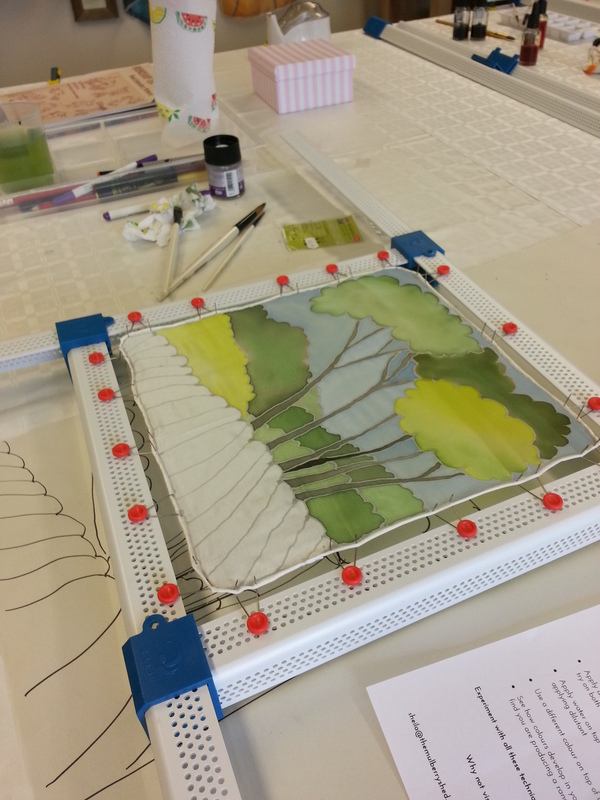 An Introduction to Silk Painting – for beginners and those whose silk painting skills are a little rusty! 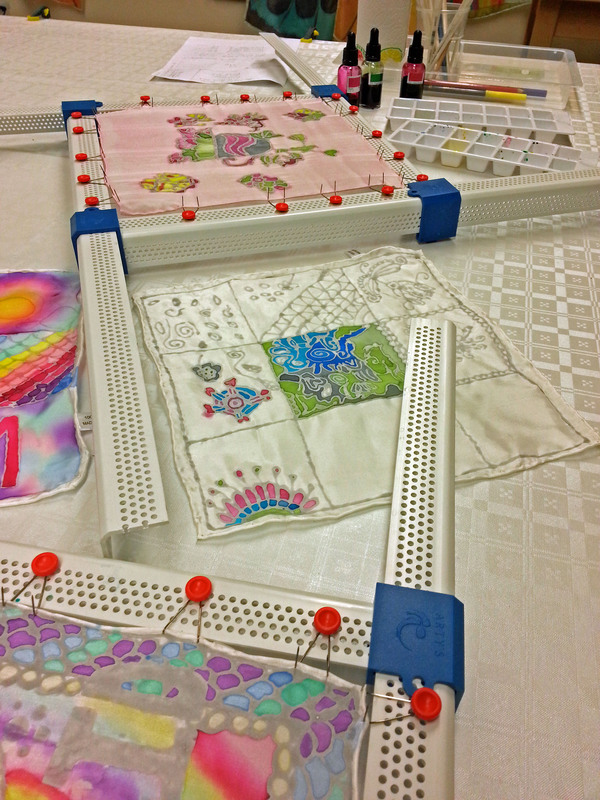 Come along and learn the art of silk painting, where we will start the day by stretching the silk on frames, and have the opportunity to experiment with using the outliner and dyes to create mini works of art on silk handkerchiefs. In the afternoon – or as soon as you are ready! – you will be able to design and paint your own silk scarf or picture. 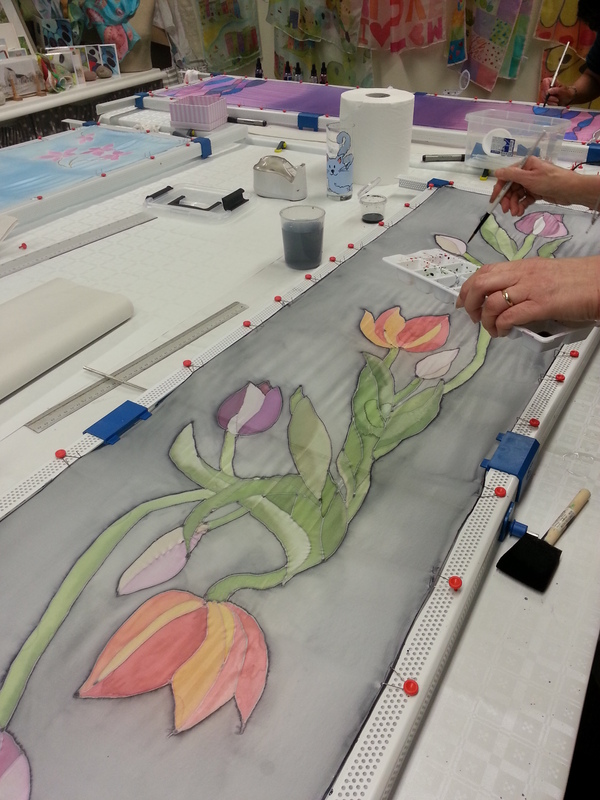 More Techniques in Silk Painting – for those who wish to find out more about the range of silk painting techniques you can use to create different exciting effects. 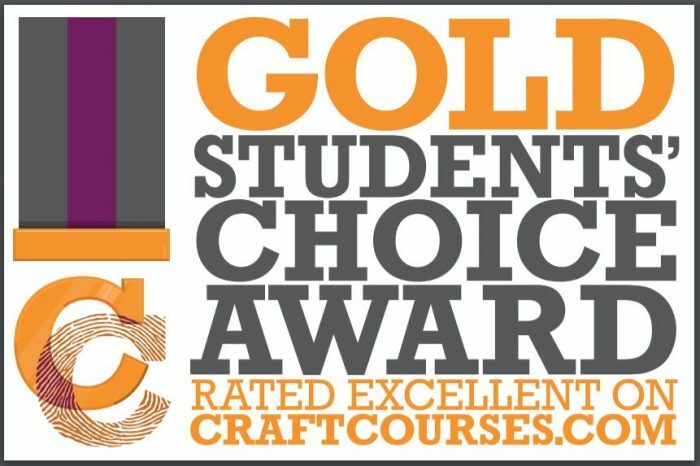 You may already have tried using dyes and outliner (gutta) but would like to develop your skills further and have fun experimenting. Come along and try out using cold wax as a resist to achieve a faux-batik effect, try using stamps or using the dyes with ‘anti-spread’ and ‘thickener’, or adding a sprinkling of sugar as you paint to create a fun effect. Silk Painting for your Wedding – come along and paint a romantic personalised pocket-square for your groom. Bring your bridesmaids to help you or why not come along with mothers of the bride/groom and enjoy the day together as they create their own bespoke scarves to match their wedding outfits. Before the day we will talk through what you’d like to create, so that the day is tailored to you, and if you wish to put up decorations in the Studio, or on the table for lunch, then this can be arranged. SCHEDULED DATES FOR 2019 ARE LISTED BELOW – Additional dates, half-day workshops, and individual tuition can be arranged. Gift vouchers available on request. If a Workshop you’d like to join is shown as fully booked I may add extra dates so do get in touch and see if there’s a date available to suit you. If you would like to book a workshop please click here to contact us!